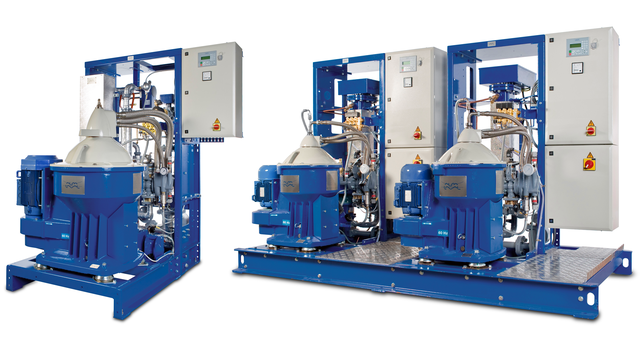 The S and P Flex range of separator systems for fuel oil and lubricating oil combines the unique strengths of Alfa Laval's S separators and P separators with a modular concept for truly flexible supply. The S and P Flex range combines essential protection with high flexibility, letting you design and construct your Alfa Laval separator system as you see fit. Incorporating the advanced efficiency of the newly updated S separator and the affordable simplicity of the P separator, it lets you choose the separation system that best meets your performance needs and available space. The S separator is the world’s best-selling and most efficient separator for fuel and lube oil. Using Alfa Laval’s unique Alcap technology, it automatically adjusts to the nature of your oil, giving you thorough protection and maximum economy from your fuel. Today’s S separator contains enhancements that further increase its efficiency. Smart modifications in the disc stack, including an increase in separation area, allow up to 20% more flow with retained separation performance. This lets you process the same amount of oil with a smaller separator. Additional features, including a more robust drive system, add to the S separator’s reliability and further reduce lifecycle cost. The P separator shares many features with the S separator, but it is designed for well-defined oils with fewer but vital process issues. Instead of the more refined Alcap technology, it has a manually set gravity disc or clarifier disc in the separator bowl. The result is a separator with the same high performance, but one that is more suitable for lubricating and marine diesel oils, as it does not automatically compensate for density fluctuations. S separators and P separators are built on a low-wear mechanical platform that features CentriShoot and CentriLock. The CentriShoot discharge system, which greatly reduces sludge volumes, has a fixed discharge slide that flexes gently at the edges to expose the discharge ports. The CentriLock bowl-locking system uses a lightweight, non-threaded snap ring that snaps in and lifts out with no more than an Allen key. Both of these features prevent metal-to-metal wear. As a result, they minimize the risk of bowl replacement and significantly reduce lifecycle cost. A separator with ancillaries as block components provides full say over the use of space in the engine room. This option allows local modularization or do-it-yourself assembly. Customer-specified modules can be created using a wide variety of skids and machine blocks. Modular components can be delivered separately and assembled on site, which makes even larger systems easy to retrofit. Mixed modules are also possible for the simultaneous treatment of different mineral oils. All deliveries feature the modular and easy-to-use EPC controller, which is based on standard supply and connects via Ethernet or bus communication to onboard automation systems. The Alfa Laval S separator is the principle component of a range of high efficiency heavy fuel oil separation systems. Based on proven Alcap oil treatment technology, the Alfa Laval S separator combines heavy fuel oil and lubricating oil treatment into a single separator, thanks to software that makes it possible to set the relevant parameters in the process controller. Untreated oil, heated to the correct temperature, is fed continuously to the separator for the cleaning of impurities. After centrifugal separation, cleaned oil is continuously pumped away and separated sludge and water accumulate at the bowl periphery. The system operates on the Alcap principle. A water transducer in the clean oil outlet measures the capacitive resistance and signals changes to the EPC60 control unit. Depending on the water content, the EPC60 either opens the drain valve or expels the water through the bowl discharge ports during sludge discharge. The total losses of sludge, oil and water during the discharge process are considerably less than other separator models due to bowl design, size, longer discharge intervals and accurate controls. The CentriShoot discharge process also makes use of a patented, fixed flexing discharge slide, which completely eliminates metal-to-metal wear. The separator design incorporates a sludge evacuation which is absorbed by the casing and which allows the sludge volume to be discharged to a sludge tank. The separator is driven by an electric motor via a friction clutch and belt. The separator bowl is fixed at the top of a spindle, which is supported by bearings and special composite springs. A patented paring tube adapts itself to remove the water from the bowl and a paring disc pumps away the cleaned oil. No adjustments are necessary in the bowl, and no gravity discs are fitted. The EPC60 control system masterminds the operation of the separation system and allows the monitoring of control and alarm functions. Clear text messages, available in several languages, indicate process parameters and alarms on the LCD display. The Alfa Laval P separator is a new development of proven technology. It is specially designed for well-defined oils with fewer but vital process issues. Manually set gravity discs have replaced the more refined Alcap technology in the separator bowl. The result is a separator with the same high performance, but one that does not automatically compensate for process fluctuations. The separator bowl can be arranged as a purifier or as a clarifier. A purifier separates sludge and water from the oil. Water is continuously discharged from the bowl. The sludge accumulated in the sludge space in both a purifier and a clarifier is intermittently discharged. In a clarifier, the water outlet is blocked, i.e. the water handling capability is limited. Water is accumulated like sludge. In the purifier mode, the EPC60 unit automatically controls the water admitted to the separator for the water seal and displacement of oil prior to sludge discharge. The separator is driven by an electric motor via a friction clutch and belt. The separator bowl is fixed at the top of a spindle, which is supported by bearings and springs. The sludge is discharged to a small intermediate sludge tank. This means that the conventional sludge tank under the separator can be avoided. The sludge removal kit takes care of the sludge by pumping automatically to the main sludge tank. During normal operation vital process parameters are monitored. The EPC60 unit provides alarm functions for low oil pressure, high intermediate tank level, and power failure. Alarm functions are also provided for errors involving the EPC60 unit. Special text messages indicate process parameters and alarms on the LCD display. The EPC60 and the starter box combine to form the control cabinet, which is type approved by many classification societies. In addition, functions are available for vibration alarm when the optional vibration switch is fitted. When operating in the purifier mode, a gravity disc must be fitted to obtain the correct interface position in the separator bowl, i.e. the boundary between the oil and the water seal. The size of gravity disc must be matched to the oil density, viscosity/temperature, and oil feed rate to the separator. In the clarifier mode, a clarifier disc is fitted instead of gravity disc. The system is operated automatically by the EPC60 control unit, except for starting the separator.